This is the time of year when homeschool moms are heading to used book sales with stacks of curriculum to sell and hopefully recoup a little of their hard-earned money. But I have a summer act of service that you may not have thought about: Why not give some of those textbooks away? Sure, David, you’re thinking. You didn’t pay for any of your textbooks; your parents did. It’s easy for you to say to give it away. Well, that’s true. However, I remember seeing my mom give away a box of books she had set aside to sell at a used book fair. We had friends who had just made the decision to homeschool. They were pulling four kids out of school, and on a country pastor’s salary, it was not going to be easy to pay for homeschool curriculum. So my mom gave them what she had put aside to sell. I don’t remember being able to skip school the next year because we had no textbooks. In fact, quite the opposite. After we helped our friends, we unexpectedly got an entire box of curriculum from a Christian school (where a relative worked) that was closing. Unfortunately, er, fortunately, we had plenty of books that year! 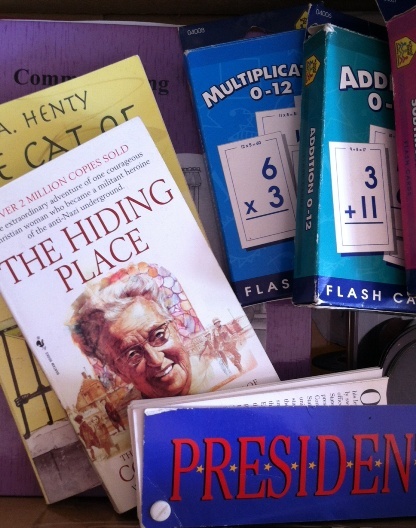 So, if you’re clearing out old curriculum–books, learning games, and other resources–to make way for new, how about giving some of it away? It might be just the encouragement another family needs. :: Any gently used children’s books are always welcomed at church libraries, children’s hospitals, and your pediatrician’s waiting room. Submitted by David Powell, a homeschool graduate whose senior project was putting together an ACT Test Prep site to help other students prepare for the ACT Test.